Can Dark Chocolate Cause Allergic Reactions? Can People Who Are Allergic to Chocolate Eat White Chocolate? 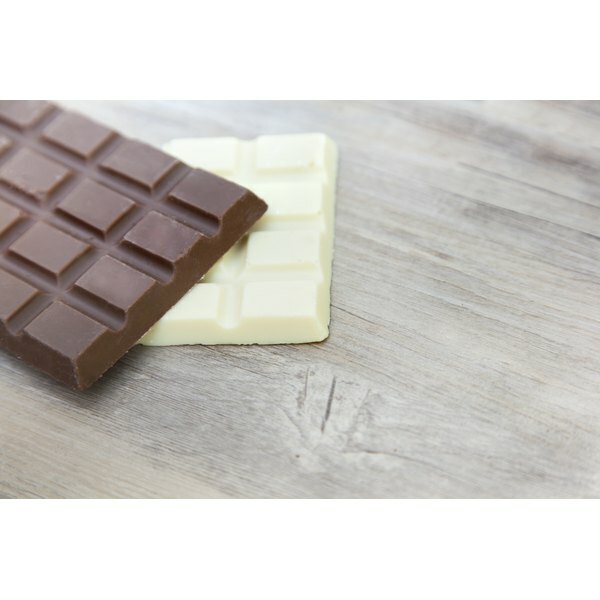 If you regularly feel discomfort after consuming chocolate in candy and other foods, you may wonder whether it's safe to eat white chocolate. The answer depends on the ingredient in chocolate causing the sensitivity or allergic reaction. It's rare to be allergic to pure chocolate, which contains solids and fat -- cocoa butter -- refined from cocoa beans. But it isn't unusual to react to common allergens found both in regular and white chocolate treats. Not all negative responses to food are caused by allergic response, which MayoClinic.com defines as beginning with the immune system's release of antibodies known as immunoglobulin E, or IgE, when the system senses a dangerous substance, or allergen. The IgE sends out chemicals, including histamines, to attack the allergen, resulting in symptoms such as itchiness, a drippy nose, bumpy hives, diarrhea and a dangerous condition called anaphylactic shock in which your airway swells and breathing is difficult. True food allergies can be life-threatening. Although less dangerous, sensitivities to substances in foods -- such as certain ingredients in regular or white chocolate -- can make you seriously uncomfortable. If you are allergic to an ingredient in chocolate, such as milk, consuming even the tiniest amount of that substance can cause an allergic reaction possibly leading to anaphylaxis. However, MayoClinic.com says that if you are sensitive to the substance -- a condition called a food intolerance -- you probably can eat small amounts without experiencing discomfort. Food intolerances are not life-threatening. Dr. Bradley Chipps of the Allergy & Asthma Network Mothers of Asthmatics says that food intolerances can be as simple as getting an upset stomach when eating fatty foods. Both regular and white chocolate are high in fat. Another condition that can mimic allergic response is when the body lacks sufficient quantities of an enzyme needed to digest a food. For example, the enzyme lactase is necessary to digest the lactose sugar in milk, a major ingredient in both milk chocolate and white chocolate. In addition to milk products, white chocolate contains sugar, cocoa butter, vanilla and soy lecithin. Except for milk, semisweet and dark chocolate contain all these ingredients along with cocoa solids. Other common food allergens in chocolate and white chocolate candy include peanuts, tree nuts and soy lecithin. Lecithin helps hold the ingredients together. Sometimes chocolate and white chocolate candy may include marshmallow, which often contains egg. On occasion, gluten -- a protein in various grains that is also a major food allergen -- may be an unexpected ingredient in regular and white chocolate drinks. White chocolate is not a true chocolate because it doesn't contain chocolate solids. But it can be a true pain in your diet if you are allergic or sensitive to any of its ingredients. Meeting with a licensed allergist for allergy testing is the safest way to determine what ingredients are affecting you and how much white chocolate is too much for you. Asthma & Allergy Network Mothers of Asthmatics: Ask the Allergist: Itching for Chocolate?